This recipe yields one dozen rolls. Stir the yeast into the warm water and let it stand for about 5 minutes. In a large mixing bowl, combine the milk, food coloring paste, cocoa, sugar, vanilla, egg, and melted butter. Using an electric mixer, beat on low until combined. Pour in the yeast mixture and beat on low for another 30 seconds to combine. Add 1 cup of flour to the bowl and mix on low speed until mostly combined. Switch from beaters to a dough hook and continue adding flour in 1/2 cup increments on low speed until the mix forms a sticky dough that pulls away from the side of the bowl. You can use a little less flour or a little more as needed to achieve that consistency. Turn the dough out onto a floured pastry board and knead it just until it's smooth -- about 10 times or so. Form it into a ball and place it in a greased bowl. Cover the bowl with a clean towel and let the dough rise until it doubles in volume. While the dough is rising, combine the brown sugar, cocoa, and cinnamon filling ingredients in a small bowl. Alternate between smashing the mixture together with the back of a spoon and stirring it until the ingredients are combined and have the texture of coarse sand. Once the dough has doubled, punch it down. Turn it back out onto the floured pastry board and let it rest for about 12 minutes. Roll the dough into a 9 x 13-inch rectangle. Brush the surface of the dough with melted butter and sprinkle the filling over it as evenly as possible. Starting on the long end, carefully roll the dough into a log. Slice the dough into 12 equal sections to create individual rolls and space them out evenly in a prepared 9 x 13-inch baking pan. Cover the pan with plastic wrap and let the rolls rise until doubled in volume. Once the rolls have risen, preheat the oven to 350 degrees Fahrenheit. Remove the plastic wrap and bake them for approximately 25 minutes. The rolls should feel a little firm but not hard when they're ready to come out of the oven. While the rolls are baking, combine all the icing ingredients in a small mixing bowl and beat on low speed until smooth. Once the rolls are baked, let them cool for about 10 to 15 minutes. 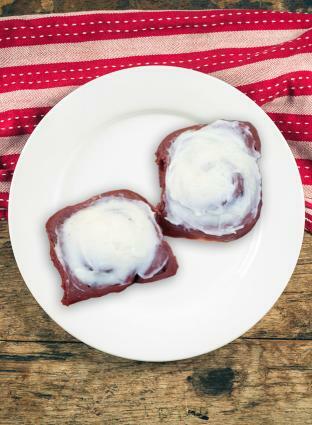 Spread the icing on the rolls and serve them warm.